So here we are the night before the storm and the picture is finally becoming clearer. Confidence is growing that significant snow will be widespread over the region. Snow will overspread the region tonight arriving after midnight accumulating several inches by sunrise. The first burst of snow will drop several inches through the morning causing slick roads. Through midday, the snow will lighten up and will likely accumulate to only an inch or so. As the coastal low starts to crank just offshore, heavy bands of snow will start to overspread the region later in the day tuesday into tuesday night. This will be the main event dropping most of the snow we recieve. This snow will let up in the wee hours of the morning wednesday but the winds will continue to howl out of the north west. Snow- Snow amounts of 10-18″ will be widespread based on location. See map. Snow map. I will adjust this one final time tomorrow morning. Wind- Winds will be gusty out of the ENE gusting at times up to 40mph. This combined with the heavy wet snow will cause scattered power outages. Tides- This storm presents no perticularly high coastal flood threat but minor splashover is possible. Confidence increases this morning as the GFS and NAM slowly come into agreement in some respects with the euro. There will be 4 main events with this storm. The first will drop several inches monday night. The second will occur tuesday morning between 5 and 9:30 dropping several more inches. The third is the main event and will occur tuesday afternoon into the evening dropping a decent amount of snow between 1:30 and 8:30. The last will occur tuesday night dropping a couple of inches more. Snow totals/map will be adjusted this evening. As the storm draws closer, we see that mother nature will not waste even one day of her precious winter as I am tracking a late season winter storm that will blow into the region Monday night into Tuesday. There is currently a disturbance in the Ohio valley that will move NNE today. A low will develop over the Great Lakes and move north while a more robust coastal low will move right along the coastline. This low will draw cold air south from Canada helping to aid in snow totals. Models disagree on just how much QPF (Quantative Precipitation Forecast) or liquid will fall. 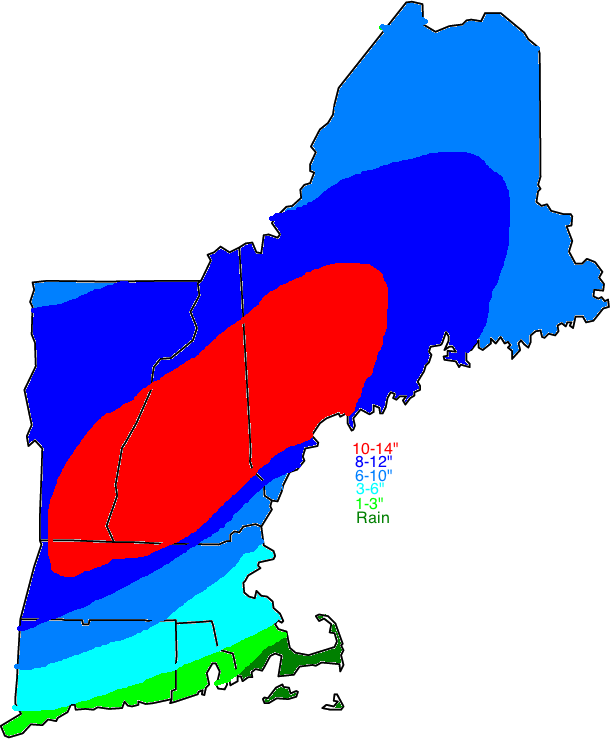 The euro has 2″ of QPF or around 20″ of snow. I think this is a bit too high but just goes to show how much disagreement there is between the models. The GFS is in agreement with the NAM that a little over an inch of QPF will fall giving us about 12″ of snow. Now, this is if ALL the precip fell as snow on a 10:1 ratio. There are mixing concerns along the coast particularly south of Portland. So that could hold down totals there. Overall, over a foot is possible in the foothills and mountains where upslope flow will aid in snowfall. I will release a snow map either later today if the models do start to agree but a snow map is much more likely tomorrow at some point. After a mostly quiet week weather wise, we have yet another snowstorm to track. This one will arrive tuesday with snow inland and a rain/snow mix at the coast. Right now, the details are still a little hazy but a plowable snow is possible for many inland towns. It will also extend the ski season for many. Expect another, more detailed post sunday as the storm gets closer. Although spring officially arrives wednesday, mother nature has other plans as this stretch of cool weather will continue into the foreseeable future. We have just one storm to look at this week. This storm will arrive Tuesday and there is pretty much 100% agreement on how it will play out. This one will be will rain everywhere. Except MT. Washington of course but then again, the rules are different up there… Sorry for not updating in the past few days. I’ve been trying to figure out how to run the WRF model on my computer and that has been quite tricky. I still haven’t got beyond downloading some file onto a flashdrive and can’t go past there until I figure out how to create a directory or whatever. Anyway, Rain will move in Monday night and last through Tuesday evening. Temps will run near 50 making for a warn, snow murdering force not good for skiing (exactly what I will be doing…). Beyond that, cooler air will move in late week with no other storms in sight. I will be at Sunday River skiing tomorrow through Wednesday so next update will be Wednesday when I return. 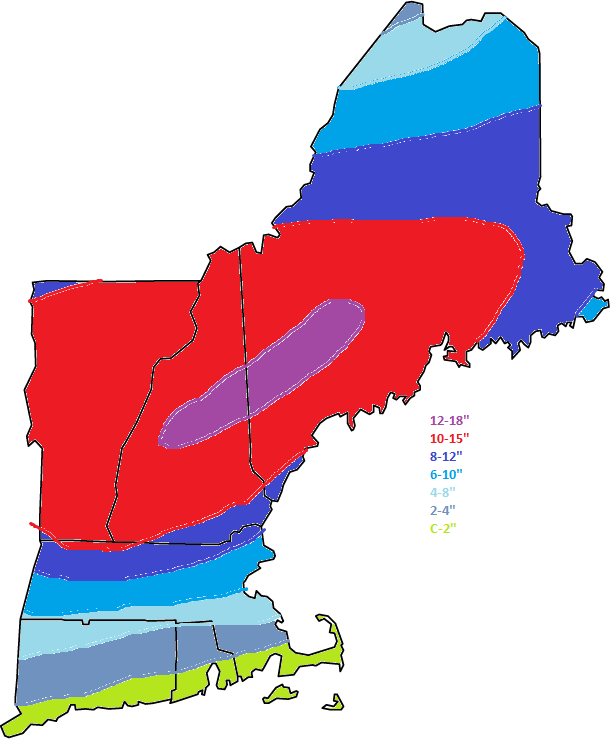 Updated snow map. 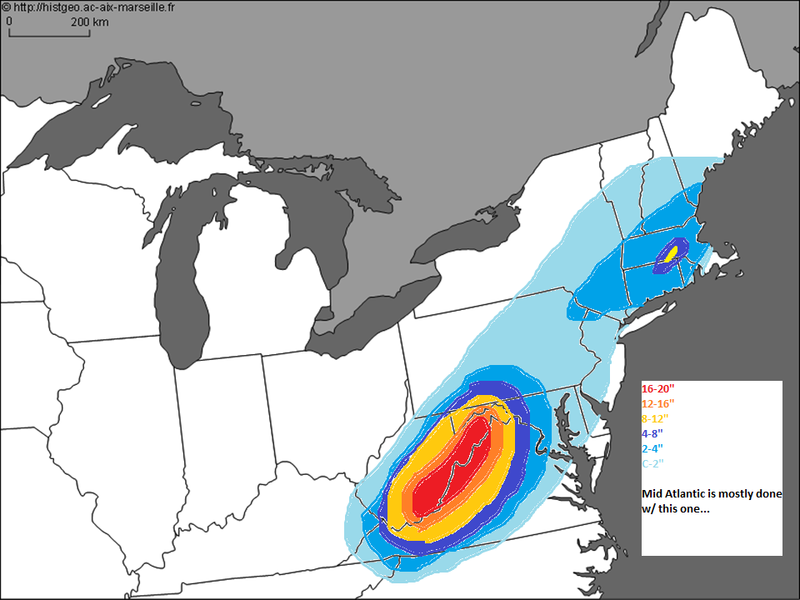 I did not include totals fron west of WVA. Not much change here. Upped Western VA totals based on current observations but otherwise the forecast is on track.